Why create the Wellness Language Toolbox? What resources did you use for reference? I love the questions that I’ve been getting about the Toolbox. Each one is worthy of it’s own blog post. I’ll answer some of them here today and others on the Wellness Language Toolbox Facebook page over the next few days. Today I will address the ‘why’s and the ‘what’. For almost 14 years, my family has been using essential oils. Along the way, we always referred to trusted resources to figure out which oil might help address the particular need at the time. One of the reasons I started this blog was to share my love of essential oils and help my readers understand how the use of essential oils can enhance a wellness lifestyle. Recently, I had the opportunity to compare our long-time favorite oils from Company A to a major competitor’s oils, Company B. Much to my surprise, I really preferred the oils from Company B. After agonizing over the decision to defect – that’s what it is considered if one chooses to leave Company A – I signed up with Company B. When I signed up, I was bombarded with information about the products. This is a good thing, but it was a bit like trying to drink water from a fire hose. A big emphasis at the time I signed up was being compliant with FDA regulations. The mood on the Facebook groups was tangibly panicky. When I checked with the compliance department at Company B, I was informed that I could not cite research about essential oils on my blog if I was going to use the name of Company B. Now I didn’t know what to do. I wanted to talk about my beloved oils and name names. But I also saw the need for spreading awareness about the numerous studies that have been done. The compliance topic has re-surfaced this week in my Facebook groups. An excellent article by Jennifer Fong has recently been posted to numerous groups. It’s called ‘You’ll Pay Millions in Fines if You Violate These Rules’. You can read it here. Have you read it? If not, stop reading my article and go read Jennifer’s. Now. Paranoid? Mad? Alarmed? Too scared to ever talk about essential oils ever again? There has been excellent support and guidance from Company B’s team leaders. Do Not Make Product Claims. Never imply that a product takes you from sickness to wellness. Specific things that we can say about individual products were published in an Approved Claims List document. There are some excellent books that have been used as reference material for many years. To create a more portable tool, I compiled the information from many resources. 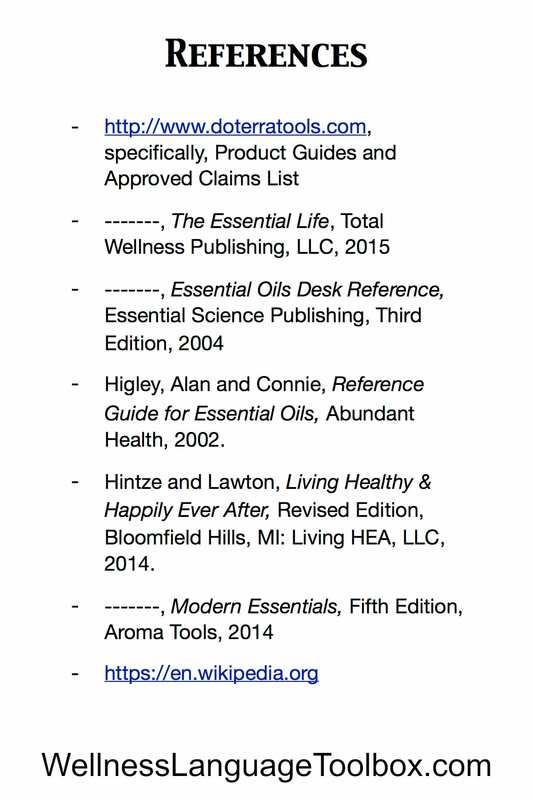 My primary references are shown in the image at the left and the list is included in the Wellness Language Toolbox. So back to the original question: Why did I create the Wellness Language Toolbox? To fill a need. The need to “address wellness in terms of body systems”. To have compliant language and a body systems reference – at my fingertips. Is it the only tool an essential oil advocate needs? Absolutely not. Please use other books and other 3rd party resources to learn more. 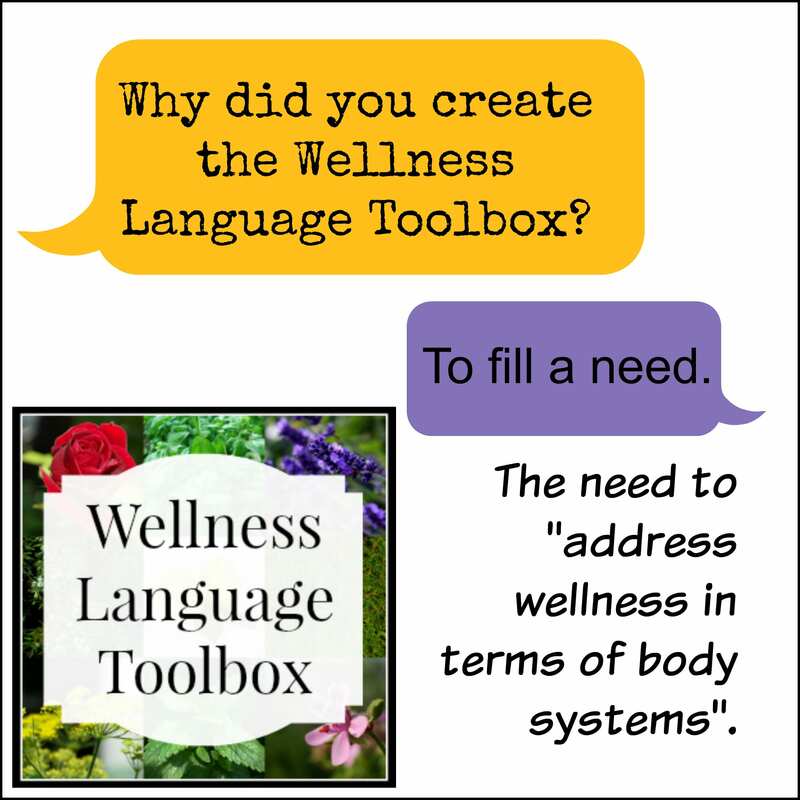 ← Announcing the Wellness Language Toolbox! Kristine, thanks for the link to my article. I applaud you and your colleagues for taking the time to really understand what is compliant and what is not with regards to product claims. As frustrating as these can be, there are many unscrupulous people out there making claims that bilk desperate people out of money without results. This is where these laws come from. It does make it harder when you have a product that works, but as you pointed out, there are many ways to share resources and let people come to their own conclusions. 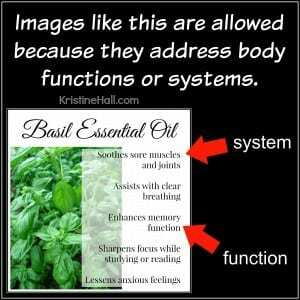 I personally am a big fan of essential oils, but it is sometimes concerning when people who are not educated on how to use them safely are advising others on their use. I am delighted to hear that companies are finally adding some teeth to their compliance policies. In the end, these policies protect consumers and salespeople alike.